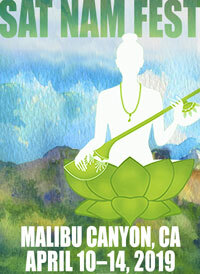 Saturday at Sat Nam Fest West started out like every other day, with early morning sadhana and yoga. 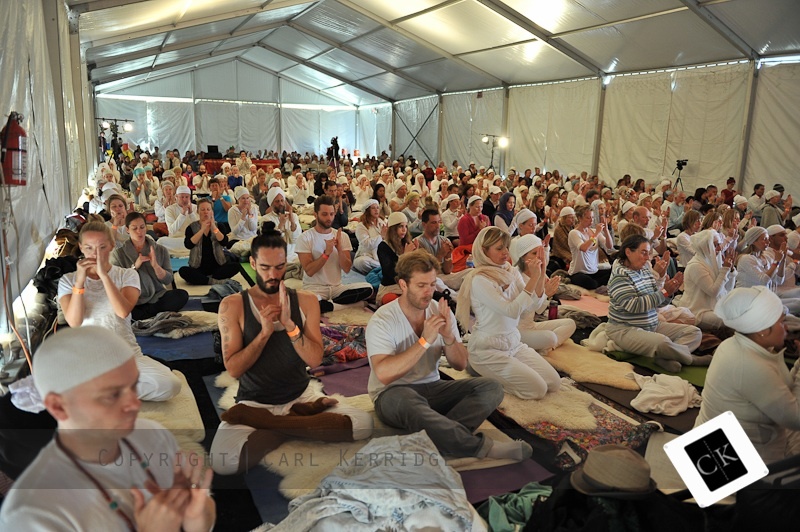 But by mid-afternoon, some whispers started going around Joshua Tree – “Russell Brand is here!” Arriving at Sat Nam Fest for Harijiwan’s class, Russell Brand sat near the stage and joined several hundred other yogis for two hours of Kundalini yoga and meditation. 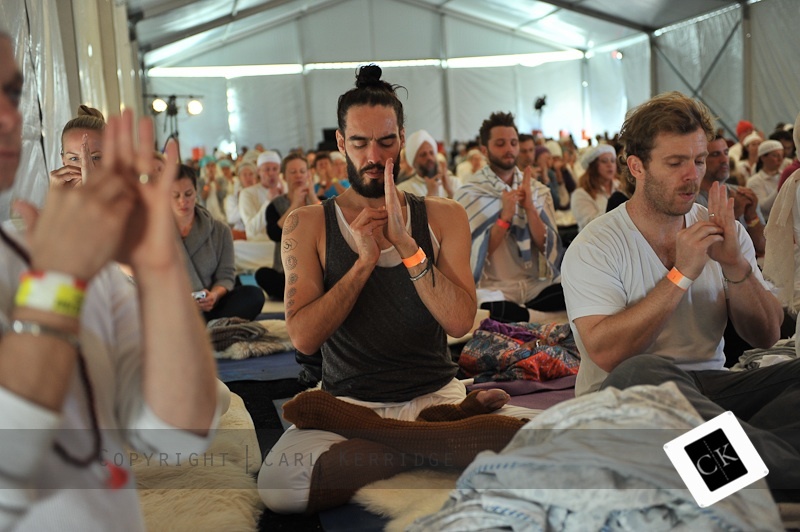 While no one went to Sat Nam Fest with a plan of celebrity watching, seeing Russell Brand in a sea of yogis was a fun reminder that Kundalini yoga is becoming more and more mainstream. Celebrities doing yoga isn’t a new phenomenon. Kareem Abdul-Jabbar was doing hatha yoga back in the 70s, when yoga was still considered a pastime for hippies. What some may not have considered is just how influential it can be when celebrities do yoga. Consider this: these days we have the internet, and a world of information at our fingertips. Not that long ago though, it wasn’t so easy to learn about things outside of the mainstream. So when celebrities like Reese Witherspoon or Gwenyth Paltrow did Kundalini yoga classes, it was a big deal for introducing a new audience to the existence of Kundalini yoga. Now that we can access news and events from our cell phones, word of supermodel Miranda Kerr bringing her boyfriend Orlando Bloom to a Kundalini yoga class at Golden Bridge spreads far and fast. 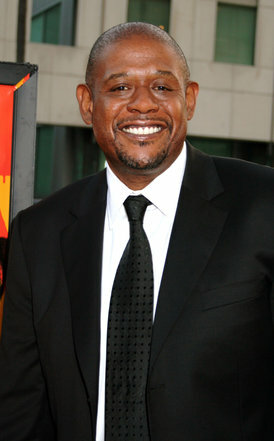 So the next time someone tells you they aren’t very familiar with Kundalini yoga, tell them it has benefited people like Forest Whitaker, Cindy Crawford, and the Red Hot Chili Peppers. Inspirational figures Mastin Kipp and Michael Beckwith have done it, as have Michelle Williams and Paula Abdul. Most importantly, tell them how YOU have benefited. That’s the most important endorsement of all. Start your own Kundalini Yoga practice with the information in this classic manual. 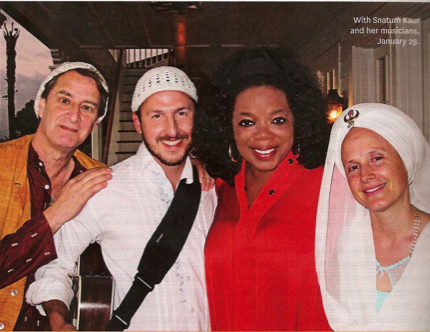 The new Gurmukh and Snatam Kaur DVD will give you a taste of what the celebrities love about Kundalini Yoga! 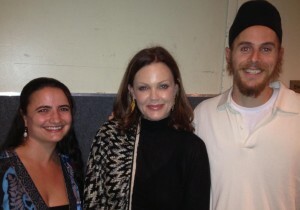 Some people need to chill out – so what if celebrities help to popularize kundalini yoga – it can only be a good thing. And dear anonymous, people who use the word ‘somewhat’ (its meaningless) really need to look within a bit more, they lack education but don’t lack pomposity and dull earnestness. Check out your own ego love. I think it helps to have celebrities share their yoga practice. People connect intuitively to those they are inspired by and will feel a calling to connect more to what may be helping those they are inspired by to be so inspirational. I know I felt that way as a teenager and gravitated to celebrities who were on a path that I was unsure about how to get on…through influences and research I found my way to yoga and various other health practices. Thank you for your post – I was in the middle of clipping my teenage sons’ hair (I cannot persuade them not to cut it) and I was delighted to be able to show them a photo of Russell Brand (whom they think is totally cool) with his long hair piled on top of his head and in a wonderful lotus pose. It stopped all talk about how weird I (and everyone else who practices KY) is – for a short while anyway! I am concerned though- did you ask his permission to use his practice as a platform? I would find it very distracting to have photos taken of me when meditating, though I guess he will be much more familiar with it than me! We did get permission from Russell Brand and his publicist to use the photos, and wouldn’t dream of having them up without. And having been at Sat Nam Fest myself, doing all sorts of yoga with the photographers running around…it was a great exercise in staying focused! I started Kundalini Yoga because of Dave Matthews. I knew of all of the benefits of yoga for years, but it’s because I love him and the joy and peace he and his music have given me, that I went to my first class, very intimidated. Two years later due to an amazing teacher and the fact that I think I was truly “ready” I am devoted to it. It has changed my life and given me comfort beyond anything I have ever known. The anger, frustration and hate that I had bottled up for years is…gone. So, I concur. Dave Matthews (or any other celebrity) may get us there, but I think it’s just the universe’s way of putting their fame to work to share little known practices with the masses. Truly using celebrity for a wonderful purpose. Sat Nam. Sat nam liz, thanks for your response to my post, i feel that you made some very good clarifications that were needed, Peace to you. The more people that have the opportunity for these teachings– which have the power to liberate– to touch their lives, the better. For them, and for all of humanity. If they hear about it because of a celebrity or because they trip and fall through the door of a yoga studio the result has the same potential; liberation. Therefore, a dualistic argument about the merits of celebrity are irrelevant. It is the desire to relieve beings from suffering that is Aquarian. 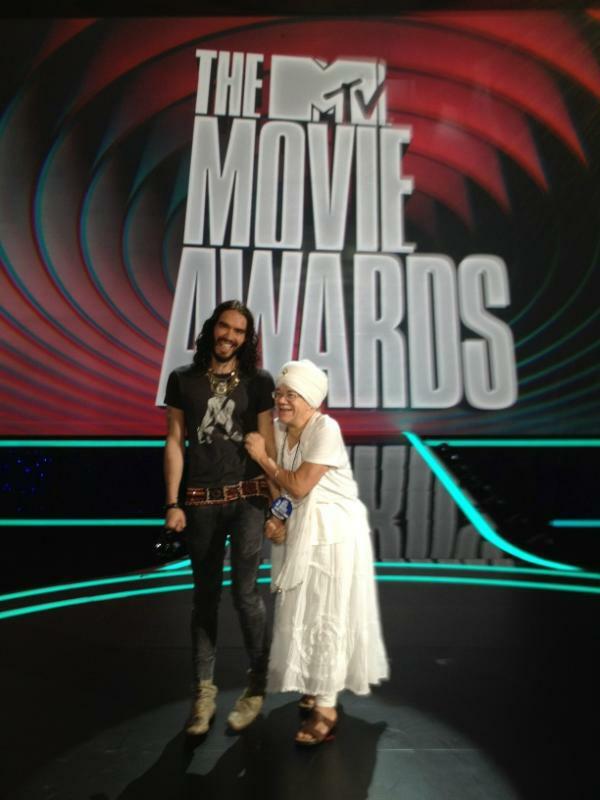 OMG Russel Brand was at Sat Nam fest and I didn’t even know, craziness. No but seriously if someone is going to get into yoga because their favourite celebrity is then by all means. I started listening to Snatam Kaur before I even knew what kundalini yoga was. I would wonder why are all these people dressed in white and wearing turbans at her concerts. I then heard Guru Singh’s Game of Chants CD, went to one of his workshops, and now I’m going to Sadhana almost everyday. Thanks for writing this blog and responding to the comments above very well written. Keep up the good work! Sat Nam Anonymous and Nam Nidhan! I am the author of the above article, and wanted to respond to both of your concerns. First, I’d like to make it clear that the above article was not written by Ramdesh, and does not reflect her opinions. They are my own, and she graciously allowed me to share them here on the blog. I just want to clarify that I never stated that Kundalini yoga is more worthy of practice because of celebrity participation. 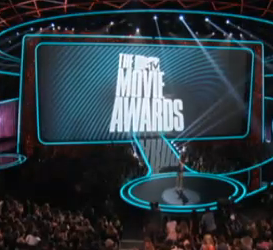 I stated that celebrities are people, just like all the rest of us. And at the end I said that the most important endorsement of Kundalini yoga a person can give is their own experience of it. I think that our own positive experiences are the best (and really only) “sales pitch” Kundalini yoga needs. That being said, I do find celebrity participation in yoga to be a good tool for exposing people who might never have heard of it. Even within the yoga world, Kundalini yoga is not necessarily as well known or understood as vinyasa, Bikram, and other styles. For celebrities to be willing to use their platform to share their practice is a good thing. I am also of the opinion that this kind of story humanizes celebrities, and in a way removes them from the pedestal that society sometimes places them on. 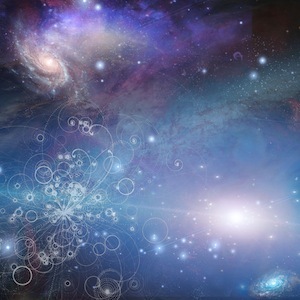 To be aware that they have chosen the same practice, whether temporarily or for life, and the potential for transformation that the practice can bring shows them in a very positive light. I think it is showing their courage and compassion to share their participation, because it means they are the same as everyone else – vulnerable, searching, seeking improvement. Just because they are famous does not mean that they are perfect, or have it all together. That’s why they are doing yoga! Also, I personally feel that there is no such thing as a “right” or “wrong” reason to do yoga. I started my hatha yoga practice in 2009 because my dance teacher had great arms. 3 years later I have a near-daily Kundalini yoga practice, with an emphasis on developing a deeper understanding of myself and how I can become a better person day by day. What may have been a “superficial” reason in the beginning led me to a more profound, transformative practice. So if a person starts practicing yoga because their favorite celebrity does, who is to say that it might not lead to something deeper? I am sorry that the two of you interpreted my words as placing celebrities on a pedestal, or saying that Kundalini yoga is better because of celebrity participation. I was simply trying to share a story that some people might find interesting, and to acknowledge the platform for creating awareness of Kundalini yoga that celebrities have. Sat Nam, as much as i really really love reading Ramdesh blogs and the things she writes i could not help but feel somewhat a bit disappointed after reading this blog and so i have to agree with Nam Nidhan Kaur’s statement about inspiring people to do kundalini yoga because celebs are doing it and because celebs are doing it now it’s right to do it. It’s nice to hear that it has such an impact but i believe that it has to be for the right reasons and not for ego purposes. I also personally believe that a person who is in tune with their true divine self would not really care who was there as that would be in such a state of neutrality. 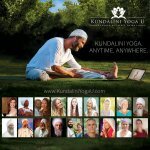 Does you comment mean that Kundalini Yoga is more worthy to practice because artists are practicing it? Is this an aquarin way to inspire people, using the same marketing strategies that bussiness people? An artist has the same value that any other human being, and we should not use their image to sell any thing .Please use ONLY if it promotes their courage, their compassion or any human value that REALLY CAN INSPIRE PEOPLE. Trough this message you are confusing people, it is a wrong message, not aquarian at all. You are doing a great job connecting people, and you have a great opportunity to serve in this job you are serving, please keep guided by your intuition understanding the impact of all you can give. I saw Cody Linley there from Dancing with the Stars/Hannah Montana fame? We’ll correct the blog above to clarify that this was Harijiwan’s class and not Gurmukh’s. If you’d like to share which other celebrities attended Sat Nam Fest, we’d be happy to know!